Rosemary is often used in savory meat dishes but it can also shine in sweet treats. 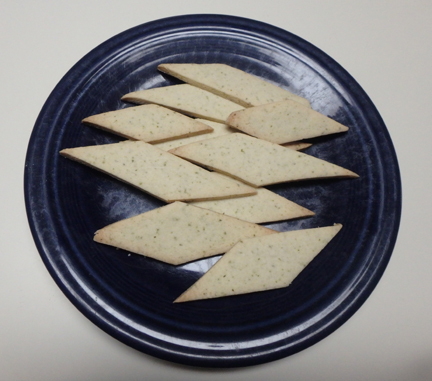 To see what I mean try this recipe for rosemary shortbread, adapted from a recipe in Recipes from a French Herb Garden, by Geraldene Holt. 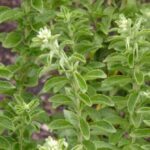 Rosemary is the perfect herb to use during the holiday season, but keep this cookie in mind come spring. It’s tasty made with lavender buds also. Here’s the printable recipe. Below it are some photos I took when I made this in my kitchen. This is called a "shortbread" because it has no leavening - baking powder, baking soda, or yeast - to create long gluten strands in the dough. Adding in the fresh rosemary lends a delightful tang to the cookie. Clip three 4-inch sections of rosemary from your garden. Remove the leaves from the stem and finely chop them, using a sharp knife or a pizza cutter. In a medium bowl combine the butter, sugar, and chopped rosemary. Add in the flour and mix thoroughly to form a ball. If you find it resists forming a ball try adding water, a tablespoon at a time. Preheat oven to 350 degrees. 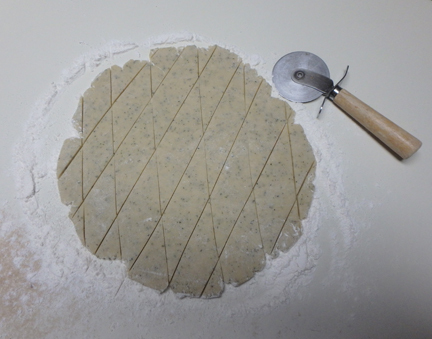 Place the dough ball on a floured surface and roll it out until the dough is about half an inch thick. 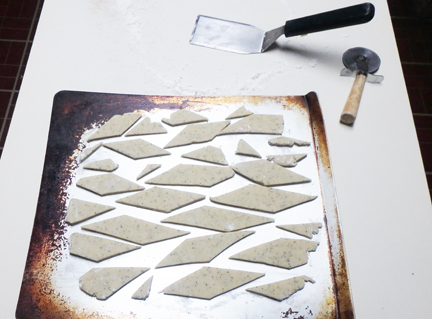 With a sharp knife or pizza cutter, slice the dough into diamond or square shapes. Transfer cookies carefully to an ungreased baking sheet. Bake for 22 minutes until the shortbread just begins to brown at the edges. These cookies will not expand during baking. Remove from the baking sheet and serve with hot coffee or tea. 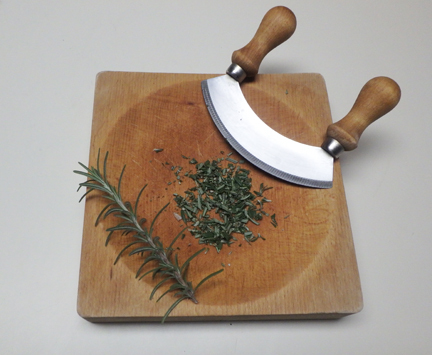 Finely dice fresh rosemary using a sharp knife, such as this mezzaluna and cutting block. Roll out the shortbread dough to about a half inch thick. Score the dough with a sharp knife or pizza cutter to form diamonds (shown) or any other shape you want. Place shortbread diamonds on an ungreased baking sheet. The cookies will not expand so you can crowd them together. Here’s the finished rosemary shortbread cookies. Next time I make this I will probably cut the dough into smaller sections.